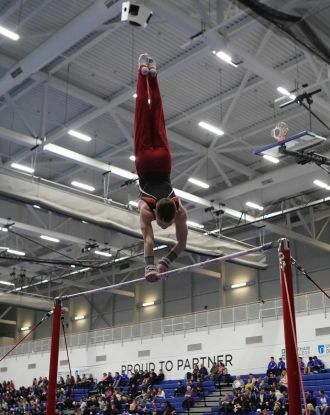 Phillip Carson, Grade 9 at Pickering College, competed as a member of Team Ontario at the 2018 Men's Artistic Gymnastics Eastern Canadian Championships in Oshawa at the University of Ontario, Institute of Technology (UOIT). Phillip finished 3rd All Round with two individual gold medals and is the Eastern Canadian High Bar and Parallel Bar Champion, (Level 4, Age 13+)! Team Ontario won the team gold medal. Although the competitive season is over, training plans are underway for the summer. If Phillip meets ambitious new goals set for himself, he hopes to compete at the National level next year. He and his family send a big thank you to everyone at Pickering College for all of their support and encouragement! Phillip Carson, Grade 9, competed as a member of Team Ontario at the 2018 Men's Artistic Gymnastics Eastern Canadian Championships in Oshawa at the University of Ontario, Institute of Technology (UOIT). Phillip finished 3rd All Round with two individual gold medals and is the Eastern Canadian High Bar and Parallel Bar Champion, (Level 4, Age 13+)!